Welcome back to my weekly review and recap of Pretty Little Liars. To catch up on previous coverage, click here. I’ve been optimistic since the season 6B premiere of Pretty Little Liars, but this week’s episode is making me lose hope. “Where Somebody Waits for Me” featured filler storylines, hardly any interesting developments and the loss of my dignity for sticking by this show for over six years. Hanna (Ashley Benson) and her perfect fiancé, Jordan (David Coussins), are enjoying some time off while lying in a heart-shaped bed. Unfortunately, the romantic getaway is cut short when Hanna receives several texts from her friends and later gets breakfast ordered from her anonymous stalker. This breakfast includes eggs and bacon forming a frown face and a fork stabbing one of the eyes. At the top of the plate, we see “Poor Jordie” written in ketchup. Could it be possible foreshadowing? Hopefully, yes because we need something to spice up this season! 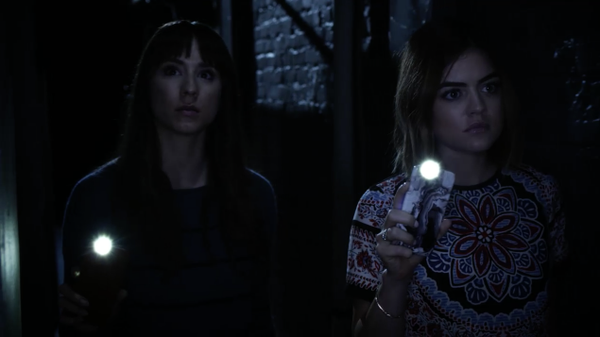 After investigating the secret hole in Sara Harvey’s room at the Radley, Team Sparia (Troian Bellisario and Lucy Hale) find switches and plug sockets and deduce that Charlotte learned all of her tricks from playing with them. They also find a secret exit and believe that’s how Sara has been sneaking in and out of the Radley under everyone’s nose. Do they realize the stalker could basically steal Emily’s baby? It feels like the raised tstakes I mentioned in my previous recap are getting swept under the rug as “no big deal.” This egg storyline better blow up in Emily’s face eventually because it’s probably the most interesting storyline on the show right now. To have Mitchell’s character get pushed to the background feels cheap. Caleb (Tyler Blackburn) informs Spencer about the Hastings opposition research he found on Yvonne’s phone. Spencer’s mother, Veronica (Lesley Fera), is sick. While Yvonne and her mother might not know anything about it, the Phillips campaign will likely try to leak the story to make Veronica look like she’s not well enough to run for office. Later on, Spencer confronts Mona (Janel Parrish) about Yvonne “accidentally” leaving her phone at lunch. It turns out that Mona told Yvonne to leave it behind to see if they can trust Spencer but Mona never told Yvonne about Spencer actually having her phone. Instead, Mona wanted Spencer to find out what the opposition plans to leak. 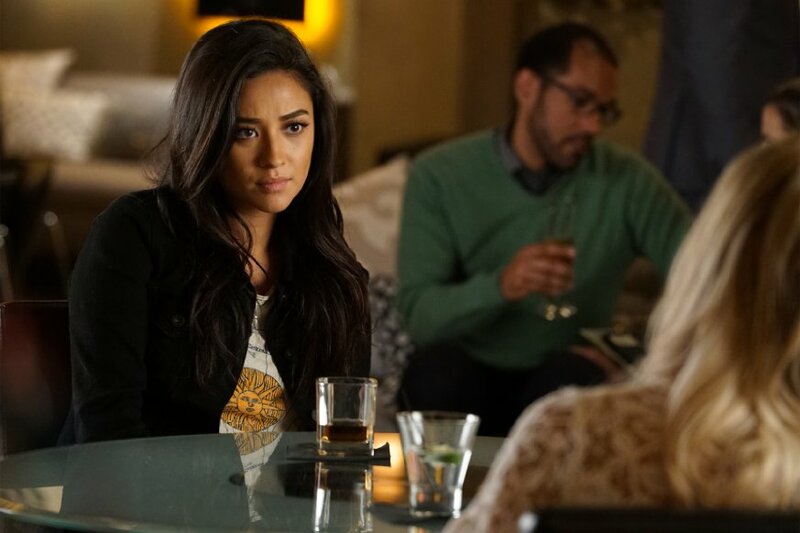 Caleb and Hanna get together for a drink to discuss the latest developments with the “A” drama (with Caleb referring to their anonymous stalker as “A” for the first time). This scene is used as an excuse for him to tell Hanna how much stronger she is now and to give us a flashback on the beginnings of Haleb’s breakup. Basically, Caleb would’ve rather stayed outside to feed a stray cat rather than be inside during Hanna’s big fashion party. And this makes them realize they don’t know what the other wants anymore. But Caleb still goes back to their apartment despite this tense conversation. Maybe we haven’t seen the official end of their relationship yet. Alison (Sasha Pieterse) comes clean to Spencer about her relationship with Dr. Rollins (Huw Collins). Since her and Charlotte’s dad didn’t want anything to do with them and Jason was obsessed with work at the Carissimi Group, she ended up turning to Dr. Rollins and fell in love with him. She says she doesn’t want to keep this relationship a secret any longer and even tells the doctor himself how she wants to go public. Why is this relationship such a big secret? Maybe I know nothing about rules regarding doctors’ romantic relationships (and if you do, feel free to prove me wrong in the comments below!) but it’s not like he was Ali’s doctor. This is nowhere near the level of secrecy that Aria and Ezra (Ian Harding) faced. Liam (Roberto Aguire) returns to Rosewood to read the latest chapters of Ezra’s manuscript. However, it turns out Liam only wants to read the chapters to confirm his suspicions that it’s actually Aria, not Ezra, who wrote most of the book. Liam encourages Aria to finish the chapter on the conditions she tells Ezra the truth. When Ezra finally returns, he apologizes to Aria for not telling her everything. The night of Charlotte’s murder, he saw Aria’s parents together and they made him keep their rendezvous a secret. And later on, he went to the House of Pies and talked with a trucker named Earl for three hours about politics. So this confirms our suspicions that Ezra would rather be seen as the creepy ex-stalker rather than come clean to Aria about anything! Also, Ezra says he spent the past few weeks in Albany and ended up writing the next three chapters of his manuscript. This should be fifty shades of awkward when he finds out his ex-girlfriend already wrote most of the book for him. The murder weapon is NOT a golf club! While we were originally led to believe the weapon that killed Charlotte was a golf club, Detective Tanner (Roma Maffia) tells Ali her sister was struck in the spine with a hollow, metal rod with a rectangular shape at the end. Additionally, someone called the DiLaurentis residence from a landline at a restaurant called the Two Crows. The phone call lasted for three minutes but both Ali and Dr. Rollins swear they did not take any calls that night. Later on, Spencer tries to lift up her sister Melissa’s suitcase and discovers the handle is broken. But the missing part is hollow, metal and cut with a rectangle on the end. And that was the most interesting aspect of this episode even though we know it’s only a red herring. I never thought “Whistle While You Work” from Disney’s Snow White and the Seven Dwarfs would be creepy but this epilogue made it so! The song plays as the mysterious stalker cleans switches and installs screws in that device in the Radley Hotel’s basement. Do you still enjoy Pretty Little Liars? Do you think it can become the show it once was? Sound off in the comments below! Liked it? Take a second to support The Young Folks on Patreon! Jeremy is an aspiring entertainment reporter from New Jersey. He has collected countless issues of Entertainment Weekly and TV Guide since he was a child and loves reading the behind-the-scenes scoop of his favorite TV shows. His proudest moment was when he had laryngitis while interviewing B.o.B and was told by the “Airplanes” singer himself that he had “a great interview voice.” Jeremy spends his spare time obsessing about fictional characters, watching Disney movies (he’s not ashamed to admit he was 23 years old when he saw “Frozen” in theaters with absolutely no kids by his side) and plowing through endless hours of soap operas on his DVR. He is still trying to replace the void he has in his heart from when “Buffy the Vampire Slayer” was canceled in 2003. Previous ArticleTV Review: The Fosters 3x14 "Under Water"
Next ArticleTV Review: The Magicians 1x05 "Mendings, Major and Minor"
#STAR 3x15 Review: Star is finally back in action in "Lean on Me"